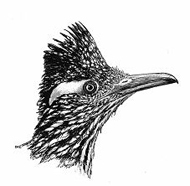 New Mexico Ornithological Society (NMOS) expands our knowledge of New Mexico avifauna by sponsoring field expeditions. These field expeditions are multiple-day trips, usually involving camping, to all corners of the state that lack ornithological knowledge or are under-birded. Increasing our knowledge about breeding densities, migratory routes and winter distribution are all foci for the expeditions. Participation is voluntary, participants will arrange their own transportation, and food should be brought by each individual. Small groups split up during the expeditions to cover as much ground as possible each day. Groups return to a rendezvous point each day to compare notes. One, possibly two, trips will be scheduled each year, focusing on different seasons. For more information on these expeditions, please contact Matt Baumann at mbaumann22@gmail.com. The inaugural NMOS Field Expedition was held on the Wind River Ranch in Mora County along the Mora River, immediately adjacent to Watrous, from 11-13 May 2012. Ten birders participated in gathering presence/absence data and relative abundance information. This 4500 acre ranch is being added to the USFWS New Mexico Refuge Complex which also includes Las Vegas and Maxwell National Wildlife Refuges. This ranch is a key piece of the >300,000 acre watershed protection area that has been identified by the USFWS as an “approved boundary” for the potential refuge lands in the area. While an incomplete avian checklist had been compiled for the area, to our knowledge this was the first targeted search conducted at the Ranch. The group assembled on the afternoon of 11 May to discuss protocol, and designate team members and search area boundaries. Early on the morning of 12 May (International Migratory Bird Day), the group split into four teams to cover designated sections of the Ranch. Habitats included cottonwood/willow riparian along the Mora River, oak/juniper/ponderosa woodland, abandoned agricultural land, and grasslands. In the evening the results were compiled over a potluck dinner while it rained. The morning of 13 May some of the group explored sections of the Ranch to try to add species to the totals and view the resident herd of American bison. A total of 92 species were tallied for the weekend. As expected, the riparian habitat supported the highest diversity with 84 species recorded; we documented 49 species in the oak/juniper/ponderosa woodlands and 30 species in the grassland-associated habitat. Ten new species were added to the Ranch list (see NMOS Bulletin 40(2): 31 for additional avian details). These data will be used to assemble a revised avian checklist for the Wind River Ranch. On 6 October 2012, nine birders braved the challenges of conducting a fall “pelagic” trip on one of the larger bodies of water in New Mexico – Elephant Butte Lake in Sierra County. The group boarded a 22-foot rental pontoon boat and daparted from the Rock Canyon Marina to explore the entire body of water in search of fall migrants and waterbirds. Captain Matt Baumann kept the boat in deeper waters (for the most part) allowing the group to scan while motoring around the pond (it exhibited some of the lowest water levels in many years). For the 5+ hours on the lake, the group tallied a total of 29 species (see NMOS Bulletin 40(3 and 4):48 for some additional avian details). Totals were submitted to the NM Bird Records Committee. NMOS conducted a field expedition to the high elevation peaks at Vermejo Park in northern New Mexico from 20-22 July 2018, led by Matt Baumann and Raymond VanBuskirk. 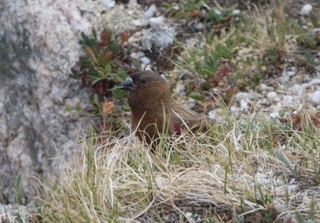 Our specific target was locating evidence of breeding Brown-capped Rosy-Finches. 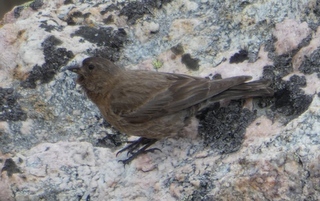 VanBuskirk et al.’s recent finding of Brown-capped Rosy-Finches carrying nesting material in the Wheeler Peak Wilderness has prompted statewide surveys for this species. Vermejo Park was considered to be an ideal location to try and search for this species because it has expansive suitable breeding habitat and a few historical sightings, but is rarely explored. We implemented VanBuskirk’s point count search protocol throughout the weekend. We looked for the rosy-finch as well as other species of interest, including White-tailed Ptarmigan, Fox Sparrow, White-winged Crossbill, Boreal Owl, and Wilson’s Warbler.